When you mix the popular dessert Mango Float with the equally refreshing drink of mango sago, what will you get is a deliciously sweet and creamy dessert in a flash. 1. Cook 1½ cups sago in 3 cups boiling water. (Like it sweeter? Add ½ cup of brown sugar.) Stir constantly to avoid clumping. Boil until the sago pearls turns translucent. Rinse in cold water. Drain. 2. In a bowl, pour in all-purpose cream and gradually add condensed milk. Mix until well blended. 3. Fold in half of the sago to the cream mixture. 4. 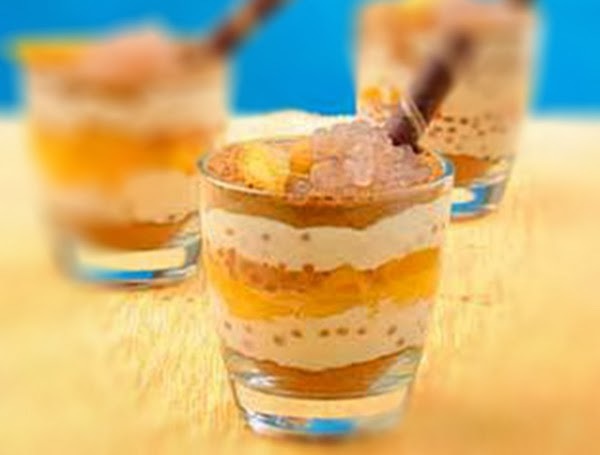 Start assembling the layers by putting a thick layer of crushed graham crackers on the bottom of individual glasses, pour cream mixture, top with sliced mangoes, and sprinkle with sago. Repeat process to make 2 or 3 layers, ending with sprinkle of crushed graham crackers on top. 5. Garnish with sliced mango, a dollop of sago, and chocolate wafer stick. Chill and serve.